var sentfrom = "Mail sent from BPMonitor"
There was something about PlugInKit. I see this screen with contents a CSV-file: http://prntscr.com/4ilgax I press button export in top-right and see this screen http://prntscr.com/4ilguk where I choose MAIL and and for several seconds I see http://prntscr.com/4ilh2h Then returns to displaying the contents of the file! In the console the same messages as when using UIActivityViewController. Even in 2016, the simulators very simply do not support sending mail from apps. Indeed, the simulators simply do not have mail clients. But! Do see the message at the bottom! -- whenever it's needed, get the static MFMailComposeViewController instance and use that. AND you will almost certainly have to cycle the global MFMailComposeViewController after each use. It is not reliable to re-use the same one. Have a global routine which releases and then re-initializes the singleton MFMailComposeViewController. Call to that global routine, each time, after you are finished with the mail composer. // APP.globalMailComposer IS READY TO USE from app launch. // recycle it AFTER OUR USE. These days it is crappy to send an email "in app". It's much better today to simply cut away to the email client. let subject = "Some subject"
let body = "Plenty of <i>email</i> body." These days, that is much better than trying to email from "inside" the app. Remember again the iOS simulators simply do not have email clients (nor can you send email using the composer within an app). You must test on a device. It has nothing to do with Swift. It's an issue with the mail composer that's been around forever it seems. That thing is extremely picky, from failing with timeouts to sending delegate messages even when cancelled. The workaround everyone uses is to create a global mail composer (for example in a singleton), and every single time reinitializing it when you need it. This ensures the mail composer is always around when the OS needs it, but also that it is free of any crap when you want to reuse it. So create a strong (as global as possible) variable holding the mail composer and reset it every time you want to use it. 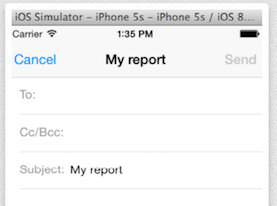 XCode 6 Simulator has problems managing Mailcomposer and other things. Try testing the code with a real device. Likely it will work. Not sure if the recycling proposed in above solution is necessary or not. But you do need use proper parameters. The delegate receives a MFMailComposeViewController* parameter. And you need to use that instead of self when dismissing the controller. I.e. The delegate receives the (MFMailComposeViewController *) controller. And you need to use that instead of self when dismissing the MFMailComposeViewController controller. That is what you want to dismiss after all. Create a property for the mail composer and instantiate it in view did load than call it when ever you need a mail composer. Hey this is solved with iOS 8.3 released 2 days ago. A simple helper class for handling mail in Swift. Based on Joe Blow's answer. Place as instance variable in AppDelegate-class and call when needed. Not the answer you're looking for? Browse other questions tagged ios uiactivityviewcontroller uidocumentinteraction mfmailcomposer or ask your own question. Is it possible to select the logged in email account in MFMailcomposeViewController swift?